Welcome to my Fairford Branch Line website. I hope it will bring back memories for anyone that knew the former Great Western line in its heyday and give a flavour of what it was like for those too young to remember it. Running for 22 miles through the beautiful upper Thames Valley, the line was constructed in two stages by the Witney Railway Company and the East Gloucestershire Railway Company. 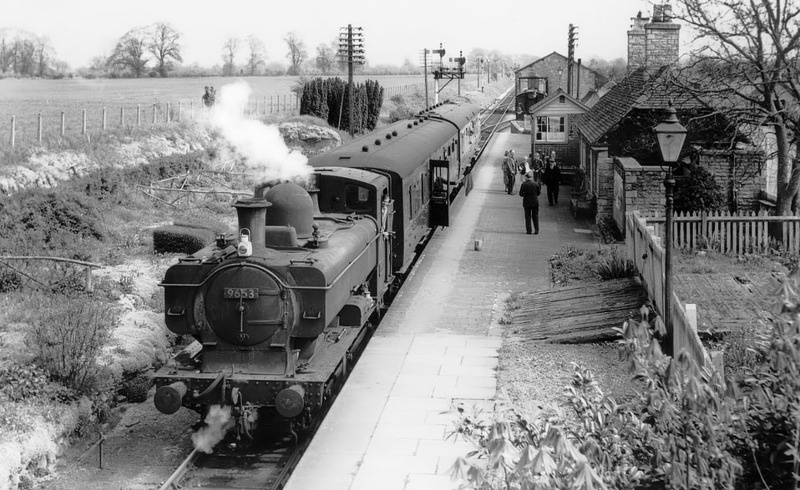 57xx Class 0-6-0PT 9653 waits at Lechlade with a two coach train for Fairford in early 1961. The guard in his Hawksworth bow ended coach gives the 'right away' to the driver, who is not taking any notice as he is watching the photographer! This website has been primarily designed to show the route of the line in detail with a mix of archive and more recent pictures, including numerous photos taken in 1979/80 when I walked the entire length of the line and much of interest still remained. The site is laid out to assist anyone who wants to investigate the course of the line today. Although most of the buildings have gone, numerous bridges survive and the actual trackbed is mostly still intact, despite the best efforts of local farmers at assimilating the line into their fields. Ordnance Survey map references are given, but please note that the description of various features does not indicate a public right of access, and indeed most of the route is now on private land. However all vantage points and footpath crossings are mentioned and certain sections are now public rights of way. Although I have included a brief history, more details can be found in the books listed in the bibliography. If you have any comments please Contact me, it would be very interesting to hear from people who have recollections of the line. Special thanks go to Stanley C. Jenkins, who provided much information for this project. Thanks also to Hugh Ballantyne, Jim Barton, Howard Burchell, John Church, Tony Doyle, Pete Dorward, Simon Glidewell, Malcolm Henderson, Keith Jones, Ian MacEwan, Colin Moulden, Owen Nicholls, Dave Oakey, Malcolm Osmundson, Peter Reeves, Gerald T. Robinson, Mr & Mrs Stewart-Wood, Paul Strong, Steve Thompson, Dorothy Waters, Ron White (Colour Rail) & the late John Strange. All pictures remain the property of the individual photographers, and must not be used for any commercial purpose without my prior permission. The website will be regularly updated, and clicking on the update date will take you to the most recently modified page. Website design © copyright 2012 Martin Loader.